It took a great a deal of work by archaeologists and historians to determine that the wreck in Beaufort Inlet is the remains of Blackbeard's flagship. The key facts supporting that conclusion involve artifacts recovered from the wreck site, along with historical details gathered from maps and contemporary 18th century documents. The shipwreck location and historical accounts of Queen Anne's Revenge sinking coincided with the wreck's location near Beaufort. N.C.
Before the Queen Anne's Revenge was Blackbeard's flagship, it was a French slave ship called La Concorde. By examining a variety of primary and secondary French documents, researchers have been able to piece together a limited history of La Concorde. Click the icons on the map below and read on for information on La Concorde's known voyages prior to its capture by Blackbeard. This Google Map approximates the historical map locations and provides the information originally researched and produced by Allison Suggs, Karen Browning, and Dr. Jacques Ducoin. Green represents a privateering voyage beginning 1710. Black represents the La Concorde's first slaving voyage. Yellow represents the second slaving voyage. Red represents the third and final slaving voyage. The prominent French merchant, Rene Montaudoin, owned the ship, which operated out of the port of Nantes. French records recount three slave trading expeditions of Montaudoin's La Concorde; one in 1713, a second in 1715, and the third and final voyage in 1717. Unfortunately, it's unclear as to how Montaudoin acquired La Concorde or the date and place of the ship's construction. During the eighteenth century, Nantes, located at the mouth of the Loire River, was the center of the French slave trade. For much of that century, the Montaudoin family operated the leading company involved in this nefarious but lucrative enterprise. Ships would leave Nantes in the spring loaded with trade goods and travel down the west coast of Africa. There, the captain would purchase a cargo of enslaved Africans to be transported to the New World. The transatlantic voyage, known as the Middle Passage, would take up to two months to complete. The Africans were usually sold at the French islands of Guadeloupe, Martinique, or Saint Domingue where they served as laborers in the sugar cane fields. Emptied of their human cargo, ships would take on new freight, usually sugar, and return to France. The last voyage of La Concorde and the ship's subsequent capture by pirates are documented in depositions filed by two of the vessel's officers, Captain Pierre Dosset and Lieutenant Francois Ernaut, when the two finally returned to France. Those depositions were obtained from the Archives Departementales de Loire-Atlantique in Nantes by Mike Daniel, President of Maritime Research Institute. According to Dosset and Ernaut's reports, La Concorde left Nantes on March 24, 1717. The 200-ton ship was armed with sixteen cannon and had a crew of seventy-five. On July 8, La Concorde arrived at the port of Judas, or Whydah, in present-day Benin. There they took on a cargo of 516 captive Africans. The captain and officers also obtained about twenty pounds of gold dust for their own account. La Concorde took nearly eight weeks to cross the Atlantic and the hardships of the notorious Middle Passage took their toll on both the Africans and the French crew. By the time they reached the New World, sixty-one slaves and sixteen crewmen had perished. After crossing the Atlantic, and only 100 miles from Martinique, the French ship encountered Blackbeard and his company. 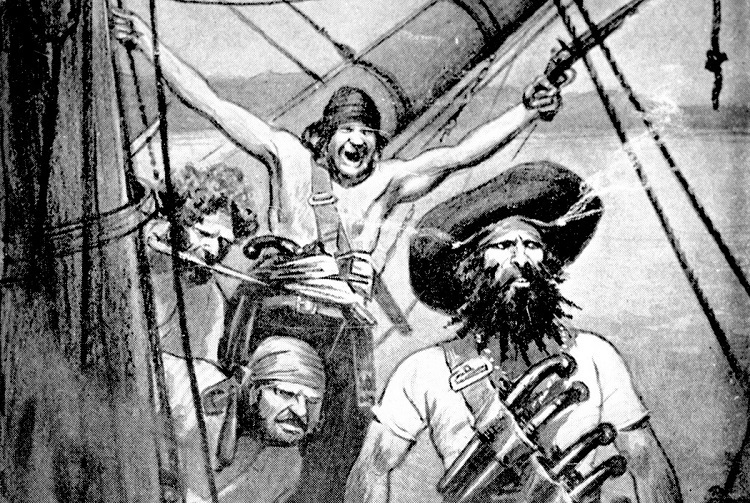 According to Lieutenant Ernaut, the pirates were aboard two sloops, one with 120 men and twelve cannon, and the other with thirty men and eight cannon. With the French crew already reduced by sixteen fatalities and another thirty-six seriously ill from scurvy and dysentery, the French were powerless to resist. After the pirates fired two volleys at La Concorde, Captain Dosset surrendered the ship. What appears here has been adapted from "In Search of Blackbeard: Historical and Archeological Research at Shipwreck Site 003BUI," by Rick Lawrence and Mark Wilde-Ramsing.